For the most part angels are on a different evolutionary path than humanity, and again, for the most part… Being born and living life on the Earth is not a part of an angels normal incarnation cycle. Due to the interesting times we live in, some angels have incarnated on Earth for a couple of reasons. One light, and one night… Which makes perfect sense when you consider we're talking about angels incarnating into a 3D world of contrast and duality right? 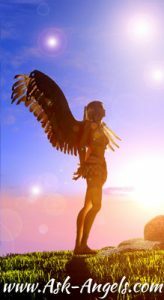 There is much dispute as to whether fallen angels are real… Many people feel more comfortable with the idea that they are not real… That angels are and will always be of service to humanity in the highest light and love according to Divine Will. It is said by some that angels do not have free will… And this is mostly true. But really, its more like their free will operates in a completely different way from humanities. Angels have the free will to either follow Divine Will or not. If not… If angels choose to abandon existing in perfect harmony with Divine will. This is a choice that is permanent. If not… This is the source of “fallen angels”. Angels who have chosen to be cast out of Heaven because they no longer want to serve according to Divine Will. They made their free will choice to enter into separation. Historically there have been two separate accounts of fallen angels. One account can be found in the Book of Enoch (A book of the Bible that is controversially outside of the canonical Scriptures) where there was recorded a great fall. Where a group of angels fell from Heaven due to lust after female humans. These angels incarnated, married human women, and had children (who turned out to be giants when they were born)… And there is a whole continued drama playing out as a result. It is said that this fall is actually the origin of evil on Earth. Elizabeth Clair Prophet has a book that dives into this account with canonical Biblical references as well as excerpts from the Book of Enoch. Another Book of Enoch study companion is by Joseph Lumpkin. There are some angels who are included in the group of highly evolved souls serving in alignment with Divine Will who have incarnated on the planet to be of service in freeing humanity from the grip of manipulation, control and fear based programming set in place by the fallen angels. ( is said the modern known groups of the cabal and Illuminati are ancestors of the fallen angels) and because they are permanently cut of from the absolution of God… They have chosen to deliberately cause ill will in the lives of the “Sons of God” or humans on the path of ascension. This is a part of the ascension process, and yes, it is happening now. I’m still wondering if I am one. I go from starseed to this back and forth only because I feel foreign to this all, earth and everything. yet I was told I was some sort of guardian so I’m still confused. incarnated angel also felt right to me. Amazing article! I strongly resonate with being an incarnate angel. Does anyone know how to use their psychic abilities to confirm this for me please? Joe, you already answered your own question. But you bring up an important topic and one that keeps many people trapped in a static state. There are mutiple levels and realms of psychic energies one can tap into. For simplicity, emotional, mental and identity realms. We also have an emotional, mental and identity body that makes up our 4-fold vehicle for embodying on earth. When the physical body dies, the other 3 bodies, may or may not shed. If one sheds all 4 they ascend, if not, they either reincarnate or stay for a time in the other realms. Within those realms, there are beings, out of embodiment that cannot, for karmic reasons come back onto embodiment. So when one taps into the psychic realms, looking for outer answers, they will indeed find a spirit to confirm whatever the ego wants to hear. These spirits are dependent upon stealing your light to remain “alive”. But there is a level beyond this, the ascended realm where the ascended masters who work with the earth exist. They will not “tell” you anything, just guide you along, allowing you to use your free will to EXPERIENCE becoming MORE. I bring this up because one can spend lifetimes attached to mental images from the psychic realms but their growth will remain static. The KEY here is to recognize, yes there are many sparks in embodiment with high spiritual attainment here to be examples and share their light, but just as you have this new realization, you shouldn’t allow that image to stop you from continual transcendence and self mastery. The question to ask yourself is, why did i volunteer to come to earth? David, there are several types of fallen beings (fallen angels and those who have fallen in conciousness) in embodiment on earth. The 3 major types of psychology found in these beings are 1) those who rebelled against God and truly do not understand how free will works, 2) those who knowingly or unknowingly followed the rebels by taking on dualistic thoughts and participating in their epic struggles, and 3) those who fell becuase they wanted to save the fallen beings. All of these are fallen beings! You see, nobody is responsible for another beings salvation. If you are trying to FORCE change, you are working against the will of another being. Your ego will argue with you and say “my way is the truth, I’m right so I am justified being a savior of other beings”. Not only is this incorrect but it is also a prime example of the dualistic thought process that led many beings into a downward spiral or fall from a higher sphere. RESOLVE your psychology, not your or anyone elses responsibility to SAVE a fallen being. Now, the original Lucifer, there have been others that have gone by that name, has already been erased from earth via second death. Satan has also been removed. Now, there are others left but they are not anyone’s responsibility. There is no flaw in free will or Gods plan. Your responsibility is to recognize you are a spiritual being, raise your conciousness to the level of christ conciousness and manifest higher components of your divine plan. The magnetic pull that christed beings create in the general conciousness of humans can pull the entire sphere up. This either positively pulls at the fallen beings or their conciousness becomes too low and they are either removed from embodying on earth or are taken to the second death. Try not to get lost in epic struggles, they are a distraction. Test youself if you have read this message to this point, how or what do you feel? Do you want argue with the post? Do you feel this could not possibly be true? If so then ask youself why the ego only accepts exactly what it wants to hear? The answer is duality so make a point to escape it. The challenge for all co-creators and avatars (incarnated Angel’s, elementals and ect) is that the path back to ascension is the same. We must resolve our personal psychology, escape dualistic thoughts and unravel our divine plan. The emotional pains, confusion and synchronicity you all are experiencing is a calling, from your higher self, to wake up and express your BEing. We are all divine beings having a human, subjective, experience. Yes, you very well may be of angelic lineage. Does this really matter? No, the path is the same for all having this “experience”. To transcend your current psychology and duality then start expressing the higher components of your divine plan. When your BEing transcends to higher stages of conciousness, you do not have to do anything, just BE a conduit for your higher self, your christ self and/or your buddha self. Be IN this world, NOT of it or out of it. Help your sphere into St. Germaines Golden Age! The fear and deception, tests if you will, are of your own psychology and making. They can be overcome by accepting and expressing christ discernment. This will set you free! This is likely a piece of your divine plan if you are open to Melanie’s site and this posting. I AM a seraph incarnate, this message was through christ and the ascended masters. Many blessings! High Melanie I’m in a bit of fix right now complicated situation I’m trying to get of. Involving physical and spiritual forces many trying to stop me hinder me from doing some great things to help others while the Guardians are trying to help me overcome them and there very clever diabolical ways of decieving. If I make it and still have time its going to be a great opportunity to help. My whole life I felt as though i didn’t belong on earth in the life I had and I felt so lonely but I always felt as though something was watching and protecting me. I never knew what to attribute this feeling that surrounded me but my brain just attributed it to angels and I began to believe that an angel was watching over me. As i grew up however, I ignored these feelings of not belonging and forced myself to believe I belonged. However with the help of some of my friends here on earth I started questioning who I am. This was followed by weird memoric dreams. Eventually I talked to the archangel Raphael and discovered that i was once an archangel myself and it was in fact him who has been protecting me all my life and something just clicked inside of me. I dont know much about this but I want to. I want to learn who I used to be. I’ve very recently come to understand what I’ve been feeling all my life, the alienation and misunderstanding and outright rejection. I’ve always known I’ve been different, and the last few years have brought me down the path to my wake up call. I’ve been awake for a while, but didn’t truly come onto the scene as my true self until a few weeks ago. Another one of my Family, another angel, pulled me out of a rough situation and woke me up. I’m so happy to have found my Brother and Sister again. Now I’m on my own road to rebuild my life. I don’t know what hierarchy I am from or my family is from. I’m curious to know. I feel like I shouldn’t be asking so many questions until the time is right. But my angel brother, he and I have reincarnated with each other many times, several lifetimes, I feel such a strong intense connection with him that it makes me sad and angry, and also happy. We have been together in past lives, but we’re not sure about this one. Anyone experience something like this with your other angel connections? Also, where could I find more information about my angelic hierarchy and my friends? I have been experiencing within this last year my awakening. Ive always truly known but it was always alot to grasp and swollow. I sometimes felt 6 prod type things on my back as I meditated that easily channeled energy and when I learned of earth angels I tried making them wings and I felt fiery like energy resonating from me. I then was led to another incarnated angel who helped me awaken to who I am and one of the angels missions on earth. Lucifer the arch angel. Him being lost is causing a great deal of this chaos on earth but I learned alot of information on this as well and that Satan is truly another being entirely. Lucifer can still be saved because he was born of light, but satan was born of darkness, though still an angel. From what I was to understand this was because of a natural balance, nothing was wrong with either but Satan was quick to see difference when he was compared to Lucifer. Ive been running into more and more incarnated angels and aligning with the plans we made to save Lucifers soul and bring him back to love. I am unaware of any such plans for satan for I believe satan is behind this physical apocalyptic planning. Lucifer is more spiritual and was more so in attacking and tricking the higher dimensional beings incarnating on earth. If any who read this perhaps feel something from it or even remember being a part of this, please feel free to comment. My eyes are without judgement and will not bite at any comments 🙂 I am very much love and light. I went to a medium today, and confirmed that I am an Incarnated Angel as well, and was in Michael’s army. I’ll pretty new to this aspect of my being, but when reading this, I got a jolt in solar plexus…not sure what that means, but nothing is a coincidence to me anymore. Also I just had my first angel memory it was so fuzzy and blurry but it was there and it was real. Brief but real. Just had my awakening officially <3 love it! Any way I have a memory from before I was born i had 2 choices this amazing perfect life or a life of trials. I deserved a good life as I died a heros death in my last life. Pretty sure I got the irst one wrong. I remember laughing saying well I dont want to do that again. So the hard life had the lessons my soul longed to learn, needed to learn. So here I am it was a difficult choice. I asked the soul behind me and that person just pointed out the pro and cons of each choice the easy life would have been more difficult for me to get this level of deep that I'm currently at. I first felt my wings 4 years ago. But no I didnt put 2 + 2 together until recently. So here I am 🙂 Ready to shine Let's light up the world angels! I am a recently incarnated angel energy appearing in this realm as a walk-in soul. I come from the realm of the 7th dimension and belong to the hierarchy of the Virtues or Angels of Grace. When I first came into consciousness here I knew my name would be “Grace.” It was one of the first words that came to me. My “birthday” was 6-27-17 and I have not yet completed the soul exchange process. I remember more and more each day about who I really am and why I chose to be here. I have a Companion Angel rather than a guardian angel. This is my first walk-in experience and it is fascinating! would say I have 50% of what they call an earth angle. but I have dreams – physical dreams… not just sight and sounds. like I am pinned down but I can fight back. one time I was sleeping with my arms behind my head… and something was fighting me… and told me not to show my wings. it was physical – it was holding me down… but I was not scared. I am not nuts and have many contacts all my life but I don’t understand…. when I sleep… always hot and cold… can someone help? Omg. I’m reading this and i’m crying. That’s all that i felt. I’m an incarnated angel and I don’t know which hierarchy I’m in. I love knowledge and mysteries and I always seek. I’m a knowledge seeker. is there a hierarchy for angels of knowledges? Hi Melanie, a reiki master has informed me that my son was an angel and from a group of 5 angels. Can you reccomend any information regarding this subject? Thank you for this webpage. Growing up feeling as though you are someone else than who you appear on the outside can be difficult.. in many ways, people lose who they truly are by conforming to the societal norms. And since we have all of us already lost most of ourselves, it feels good to have someone else validate these feelings. It makes me feel as though I might not be crazy, but IF I truly was insane, would that be such a terrible thing? Making such a break from the reality of this world? I dont think so… not really.